Early 1852. Somewhere in the vicinity of Washington City. Two men, each with an entourage, face off with pistols. One, Edward William Johnston, is an editor of the Richmond Whig. 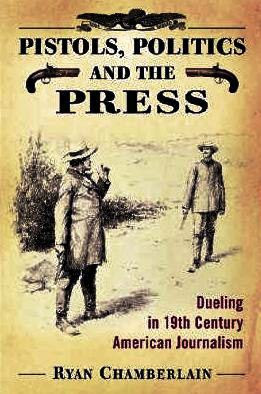 His opponent is John Moncure Daniel, editor of the rival Richmond Examiner. They began in 1851 with cutting back-and-forth remarks about the transportation of a version of Hiram Powers' marble statue, The Greek Slave (1844). Cherchez la femme! (The Greek Slave, Corcoran Gallery of Art, Wikimedia Commons). From poking fun to attacking one another, their acidic writing turned from mockery to an actual physical duel. Now geared up in January, 1852, Johnston and Daniel squared off against each other. Both fired a pistol shot -- into the air. When it came down to the nitty gritty, both men must have realized how ludicrous the situation had become. Daniel later claimed to have taken pity on Johnston. I'm still looking for additional details, but more will be revealed. With their pistol duel out of the way, Johnston and Daniel seem to have gained in respect for each other. Daniel later supported the generalship of Edward's brother, Joseph Eggleston Johston, over Jefferson Davis, the Confederate president. However, Daniel was shot in a final duel and died less than a month before Abraham Lincoln.